Bags of frozen hash browns cost $2.50-$3.00 each at the grocery store. Sometimes if Im lucky I can find them on sale 2/$4. That is for a 2pound bag. 4. Coat with vegetable oil. I just pour a little in and stir. Repeat until potatoes are covered. 5. Season to taste. You can use just salt and pepper or add garlic powder, onions, paprika... whatever. I used zesty seasoning salt. 6. Dump potatoes on a cookie sheet. Make sure its a single layer for best results. 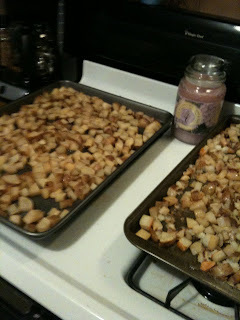 For 5lbs of potatoes I use 2 cookie sheets. 9. Once cooled place cookie sheet in the freezer and allow for them to freeze. To cook: Microwave frozen hashbrowns for 1 minutes to defrost slightly. The cook them in a preheated pan with a little oil (or butter) until browned. **I freeze mine in 1lb pouches. I get 5 bags from this recipe. I saute mine in a little butter and add onions and green peppers. 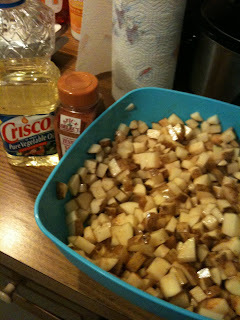 So that is 5lbs of hashbrowns for about 75cents.... maybe 85 if you count the cost of oil/salt. So a 2lbs bag cost me 37cents! Smells like a bargain to me! this is so smart! i'm going to try this! i'm wondering if you could do it the same way for shredded potatoes? or would you parboil those?